Have a look at this stunning grey crop top with an open back. It is teamed with light blue skinny jeans and white sneakers. A lovely combo for Summer street walks around town. Keep things casual this summer. Go for a ripped grey front-tie T-shirt and team it with knee-ripped jeans and white sneakers. Complete this combo by adding rounded sunglasses and black leather shoulder bag. A perfect Summer casual style. Have fun with this oversized khaki green blouse for Summer season. It is a nice option to wear with ripped slim jeans and white sneakers. Complete this combo with a black leather saddle bag and rounded sunglasses. A stylish outfit for Summer street walks. Here we see a 1990’s inspired outfit idea. A young lady is wearing a cool Fendi backpack styled with a grey knit crop top and wash blue high-rise jeans. In love with these white sunglasses. 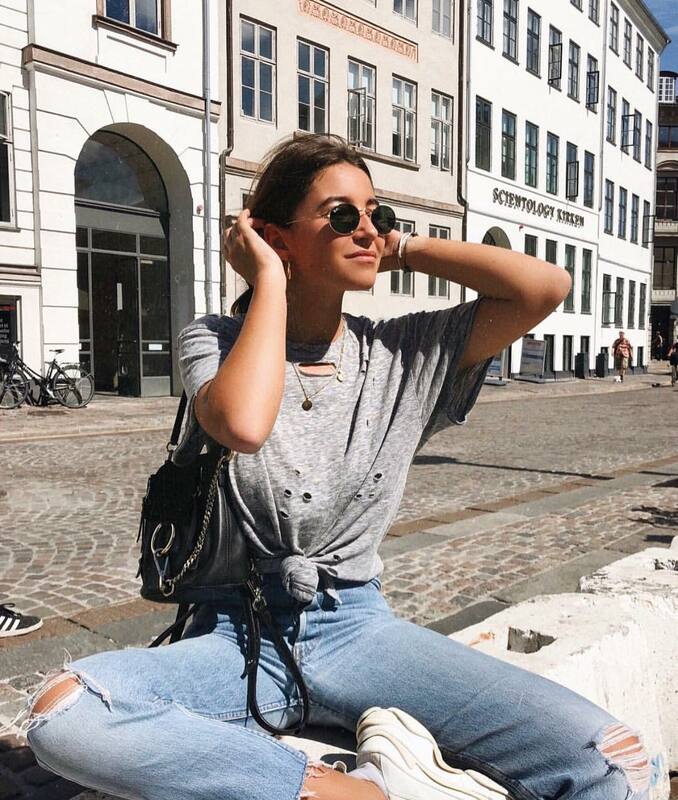 You definitely can wear a white linen shirt this Summer, just team it with some jeans or denim shorts and complete it with your favorite rounded sunglasses and eye-catchy earrings. That’s what I call the minimal style. We see a white strapless crop top with long sleeves teamed with regular fit jeans in blue color. The outfit is completed with rounded sunglasses and high-heeled sandals. Have a look at this cool grey front-tie T-shirt teamed with high-rise light blue jeans. Complete this combo by adding aviator sunglasses and belt pouch bag. Have a detailed look at this grunge chic outfit idea that consists of a black leather jacket, white front-tied T-shirt and light blue slim jeans. A simple clothing combination. You are free to wear it during the day. Don’t have time for a casual weekend this Summer? Keep your style simple and relaxed, go for a pink tank top and team it with a pair of skinny jeans in blue. You definitely should give this outfit a try.